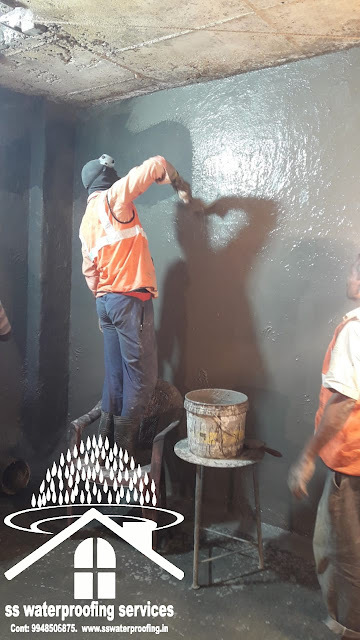 We give good services: Terrace waterproofing, water tanks waterproofing, bathroom waterproofing, wall seepage, wall cracks, swimming pools leakage, epoxy grouting, sump leakage, pillar seepage, beam seepage, roof waterproofing contractors, waterproofing services, all new and old building leakage, and seepage issues solve, n etc..
BATHROOM WATERPROOFING : Bathrooms are most sensitive and quite prone to leaking walls and seepage. This is because of faulty layouts or untreated or uncured tiles. Bathroom waterproofing ensures that your bathroom walls along with the adjoining walls, ceiling, and floors are protected from fungus, seepage, and leakage. Water is the most corroding element ever and if we are not careful it may create unwanted damage to your precious home. If you are getting your bathroom renovated or newly built, we advise you to undertake bathroom waterproofing from SS Waterproofing services to ensure that your bathroom along with your neighbors’ is protected from water damage. We use a flexible, super polymer membrane that is painted atop your bathroom surface, making your bathroom completely safe to use, and totally damage resistant. Toilet waterproofing is completed before tiles square measure ordered. In many cases, your toilet facility preserver or employee will embrace waterproofing in their quote. Waterproofing merchandise square measure usually sheets or a water-based largely, flexible, superior polymer membrane that's painted onto a surface. 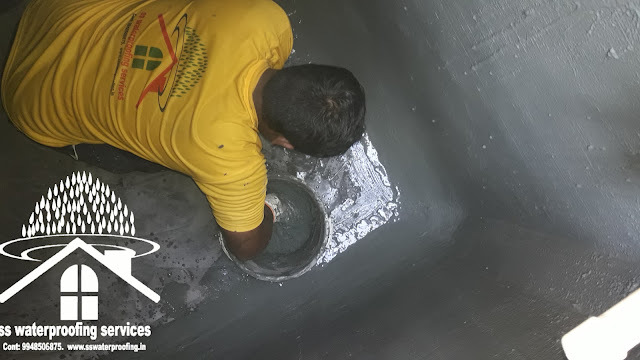 Bathroom waterproofing contractors roof waterproofing services sump leakage swimming pools waterproofing contractors terrace waterproofing water tanks waterproofing contractors in Hyderabad. 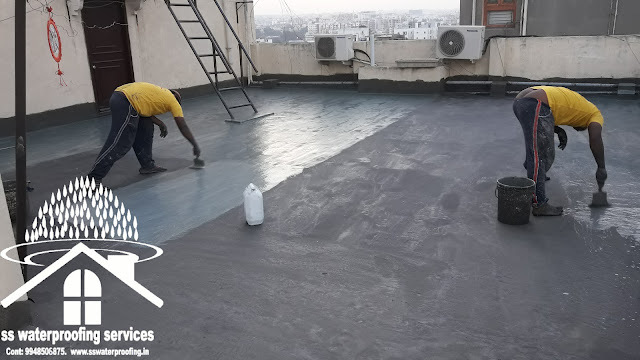 Terrace waterproofing, Water tank waterproofing, Bathroom waterproofing, Walls waterproofing, Roof waterproofing, Swimming pool waterproofing, Sump waterproofing, Overhead tank waterproofing, Waterproofing Contractors, Waterproofing services, Waterproofing contractors in Hyderabad, Waterproofing services in Hyderabad, ss waterproofing contractors, ss waterproofing services, ss waterproofing contractors in Hyderabad, ss waterproofing services in Hyderabad. TERRACE WATERPROOFING :Terrace waterproofing is quite tricky as the surface is flat and the water cannot flow in any direction, making it stand still wherever it collects. This gives a bigger opportunity to result in seepage and leakage. These flat surfaces require a sump or pit for the water to collect before it passes through the drain pipe. All these factors combined together calls for extensive waterproofing. WATER TANK WATERPROOFING :Since concrete is less flexible, it has a tendency to crack over a period of time. With continuous water present in water tanks, it is imperative that you consider water tank waterproofing to avoid the build-up of fungus or seepage. 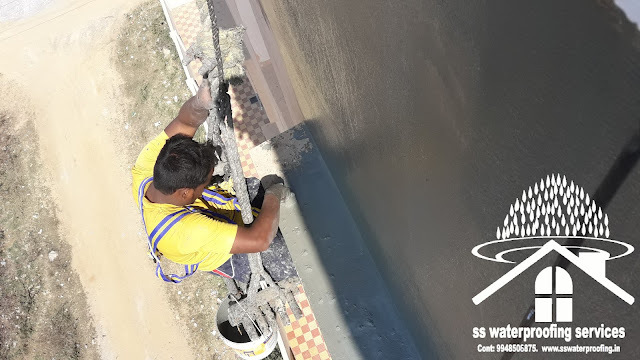 Water tank waterproofing provided by SS Waterproofing Contractors in Hyderabad adhere to all norms that are required to be followed to ensure healthy water storage. Right from curing the surface to properly grouting all joints, etc. we ensure that your precious home is not affected by leaking water tanks or unhealthy drinking water. Products used by SS Waterproofing Contractors in Hyderabad are completely safe to use and do not cause the water any harm. ROOF WATERPROOFING : If you have a sloping roof or a flat one, there is one that is most common in both of the- water seepage. Roof waterproofing protects your home and building against water collection and extreme weather conditions. With a sloping roof, getting them treated well in advance will help the water slip down the drain pipe, making it slightly damage proof. However, with flat roofs, the water tends to collect around the edges, if they do not have a proper slope and drain system. SS Waterproofing Services take care of all your roof waterproofing requirement and build a strong layer on the surface to avoid seepage. We help your roof to battle damp patches and make it more weather friendly. This results in no or less seepage in your home, through your ceilings and walls. Get your home roof waterproofed today with the help of SS Waterproofing Contractors! WALLS WATERPROOFING :The one place where you see cracks and mold develop is on the walls. Whether it is in your home or in your office, it absolutely disheartening to see the seepage that can penetrate through the walls. Wall waterproofing provides ultimate protection from any weather condition and lasts for a very long time. 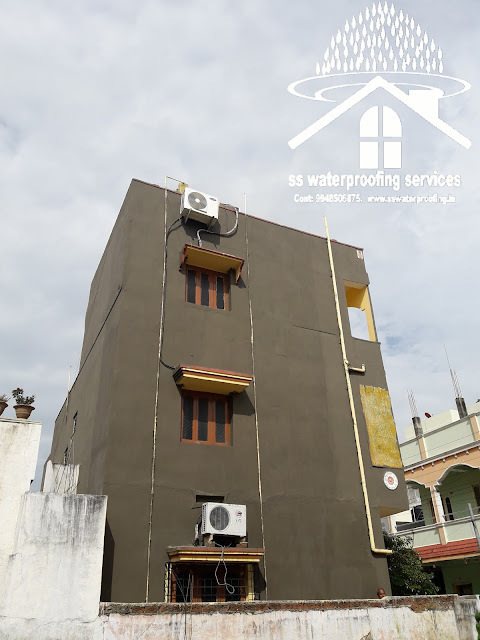 SS Waterproofing Contractors in Hyderabad have been providing extensive wall waterproofing for new and renovated homes. The materials utilized by us are weather resistant and can withstand extreme conditions as well. They protect the structure or building, preserving their sheen and integrity. They are given special thermal and wet protection to make the wall waterproofing better. OVERHEAD TANK WATERPROOFING:There is nothing more unhealthy than an overhead tank that stinks or has any sort of bacteria builds up in them. Overhead tank waterproofing ensures that the water does not seep into your homes at any given point of time. SS Waterproofing Contractors undertake crystalline waterproofing system that is additionally fitted in your overhead tank to avoid any leakage. Every crack and crevice is properly treated to ensure that there is no water that can leak through the pipes or joints anywhere. Additionally, there is a lot of care taken to coat the pipes present in the overhead tanks with anti-rust elements and waterproof solutions to ensure no damage to them as well. Connect with the experts at waterproofing, SS Waterproofing Contractors, today! SUMP WATERPROOFING : It is important to preserve the structural integrity of water tanks because of their constant exposure to water. We never know when water can seep inside our home or through the walls, causing unwarranted damage. 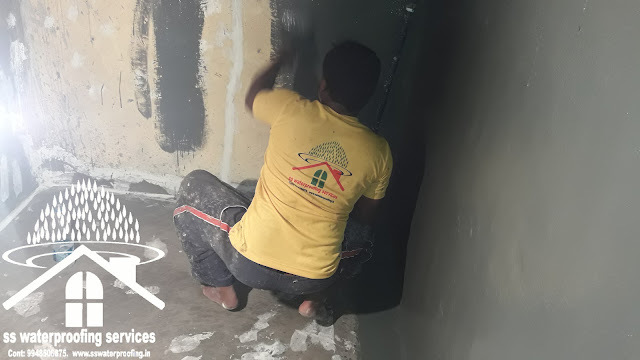 To ensure that you have the best sump waterproofing done, SS Waterproofing Contractors of Hyderabad take care of every detail surrounding their build up. The water tanks have to keep clean at all times. You may undertake regular maintenance and clean-up of the water tanks, but once there is water in them, you cannot completely dry it off. Before you allow water to be filled up, you need to undertake sump waterproofing to ensure that there is no build up of algae or fungus. These are potentially harmful to anyone consuming the water and can prove to be a big health infliction. SS Waterproofing Services in Hyderabad have all the modern methods and equipment to help you waterproof your tanks seamlessly. SWIMMING POOL WATERPROOFING :If you live in a society, there is often one or two swimming pools that are part of the infrastructure and recreational activities. While building a swimming pool, you need to ensure that there is no seepage or leakage of any kind that can potentially harm your building or basement. This also holds true for anyone building a swimming pool on their building or home roof. There are high chances of seepage if proper treatment is not administered right at the beginning. By applying cement mortar to the walls and floor of the pool area, we manage to create a water block that will not allow water to seep in. This protects the pool from any water damage that may arise over a period of time. The pool can be easily cleaned and chlorinated to avoid the build-up of any algae or bacteria. 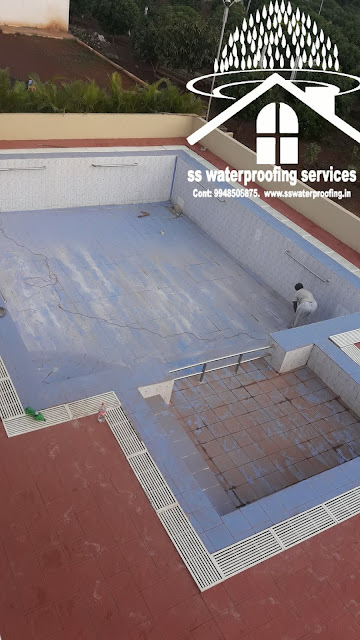 Connect with SS Waterproofing Services in Hyderabad to get your swimming pool waterproofing done today! Submit Url blogville FREE URL Submission - Submit your site to dozens of top search engines for FREE. No strings attached!